Xavor’s Hosting Services enables Agile PLM customers to completely outsource the underlying operation of their Agile PLM applications and truly feel that they are using a cloud/SaaS application. What Can Xavor’s Hosting Services Do For Your Business? 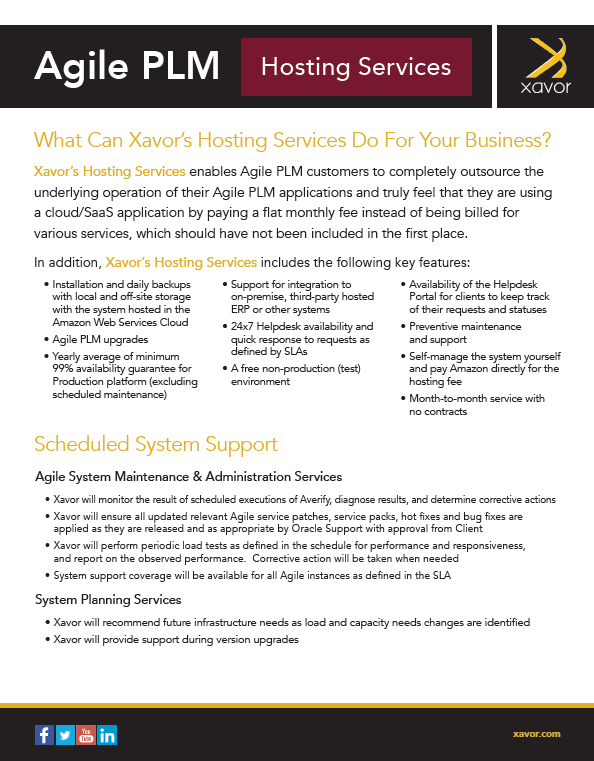 Xavor’s Hosting Services enables Agile PLM customers to completely outsource the underlying operation of their Agile PLM applications and truly feel that they are using a cloud/SaaS application by paying a flat monthly fee instead of being billed for various services, which should have not been included in the first place. System Down, or Important features of the Software are not working properly and there are no acceptable, alternative solutions. Xavor acknowledges the issue within 1 hour. Technical resources are engaged as needed to resolve the issue as soon as possible and works the issue 24×7 until a resolution or acceptable workaround is provided. Provides update every 4 hours. Important features of the Software are unavailable, but an alternative solution is available; or, non-essential features of the Software are unavailable with no alternative solution. Xavor acknowledges the issue within 4 hours. Provides estimated date/time of resolution within 8 hours. Provides update daily. Client submits a Software information request, software enhancement or documentation clarification which has no operational impact. The implementation or use of the Software by the Client is continuous and there is no negative impact on productivity. Xavor acknowledges the issue within 1 day. Provides estimated date/time of resolution within 3 days. Provides update weekly.